Lights, camera, action! It's been a long time in the making but the Thinking Green segment featuring Thinkvacuums and Drainvac is finally ready! So, here's the schedule for our previously discussed Designing Spaces segment airing on both the TLC network and WeTV! We were told by the network executives that the total potential households this will be aired on is over 180 MILLION! That's a HUGE number, we can't wait to see what happens after that amount of exposure. We hop e you guys tune in and let us know what you think! We're also having a special offer in conjunction with Drainvac! If you've seen the segment on tv, give us a call and mention it to us to get 8% off any single item featured on the show, including Drainvac central vacuums, ActiVac II exhaust filters, any Drainvac accessory (such as bags, belts, etc). We're proud to be introducing the all new NuTone CT700 Power Brush! As always, it provides exceptional cleaning with a fresh new look and greatly improved features. It integrates powerful LED front-lighting for industry leading lighting performance. In addition to superior lighting, the CT700 features a swivel neck for easy maneuverability as well as LED carpet height indicators. Head-to-head testing shows increased cleaning performance over the existing CT600, CT650 models, as well as competitor's offerings. Performance features include exceptional soil removal, superior LED lighting, maximum maneuverability and ease of use, along with a four position height adjustment. The CT700 will replace the current CT600 and CT650 power brush models. In addition to the new power brush, we are also introducing new wants to accompany the CT700. The new CT170 (for use with 20-series hoses) and CT175 (for use with 15-series hoses) offer length adjustment capabilities and concealed cord management. Both CT170 and CT175 are used only with the CT700. These great new products will be available on our website early February, so keep your eyes peeled. You can also follow us on Twitter for even more news and updates. Dirty vacuums, and new vacuums! Take a look at the motor to the left. This is a central vacuum we just received from a customer for repair. All of the white stuff covering it is plaster from construction dust. This particular vacuum was used in a brand new home, but the homeowners cleanup crew used the central vacuum instead of a shop vac, which is designed for this type of cleaning. 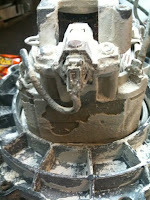 There is a thick, solid layer of motor choking powder, which suffocated the motor and caused it to burn out. Typically, no central vacuum on the market can handle this type of fine powder. Most instruction manuals that come with the vacuum advise not picking up such fine powder, for this exact reason. This particular problem was not caused by the homeowner, but by a cleanup crew worker who just used the vacuum assuming it would work just fine. Most manufacturers would not cover this under warranty because this is deemed abuse. It's sort of like running a brand new car with diesel fuel, it's not designed to work like that. We called the manufacturer to help our customer out, and they could not cover it under warranty at all. 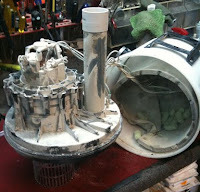 We ended up putting a new motor in ourselves at our cost, just to accommodate a customer. That's the kind of customer service you can expect when you're a customer of Thinkvacuums, we go above and beyond whenever we can. 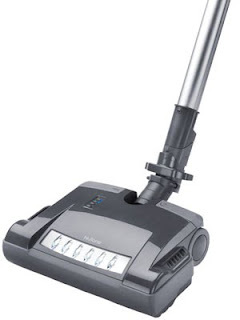 Getting off the topic of central vacuums, we just added some new updated Sanitaire vacuum models to our website! These are updates to well known models, the Sanitaire SC5845-B and the famous Sanitaire SC9180-B. Personally, I think these models look very sleek, the new design and color make it very visually appealing. Sanitaire is coming out with updates to other well known models in the future as well, and if you want to stay informed on the latest news bookmark our blog and our Twitter as well.